One of Doug Ford’s closest allies boasts the Ontario Premier’s move to slash half the seats at Toronto City Hall will cripple Ford’s political opposition. Speaking at a press conference at Queen’s Park on Monday, Toronto Councillor Giorgio Mammoliti said Ford’s gutting Toronto City Council is a good move because it would silence “left-leaning” voices on council. “There is going to be less left-leaning politicians in the City of Toronto,” Mammoliti told reporters. 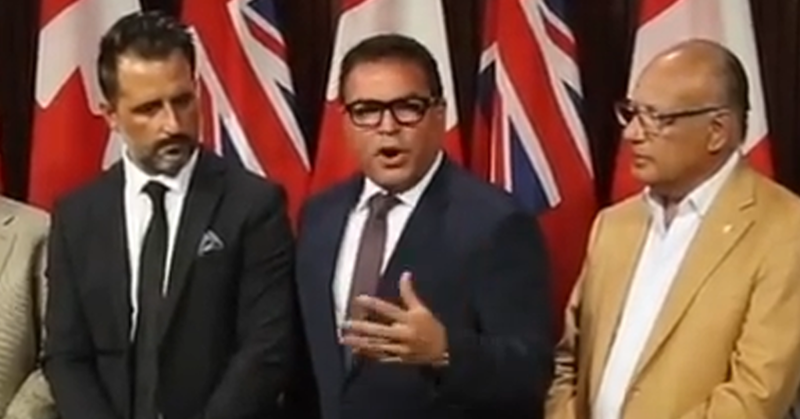 Although the move to redraw ward boundaries only months before an election with zero consultation is being called “undemocratic” and Ford is being compared to a “tinpot dictator,” Mammoliti defended Ford’s unilateral move to interfere in local elections on the grounds that his “gut instinct” is unquestionable. In 2016, Mammoliti was one of several suburban Toronto councillors who appealed City Council’s decision to adopt the recommendations of the independent and non-partisan Toronto Ward Boundary Review, established to evenly distribute political representation in response to Toronto’s exploding population growth. Mammoliti and other suburban councillors who appeared at Queen’s Park opposed the evenly drawn boundaries because it gave better representation to heavily populated areas downtown. In April, Mammoliti announced he was planning to run for the Ontario PCs after being personally urged to seek provincial office by Doug Ford, although he later backed out of that plan. “I’ve been so loyal to the Fords,” Mammoliti said at the time, adding Ford’s movement had started to feel “almost like a religion” for him. Toronto Mayor John Tory has reportedly re-hired campaign strategist Nick Kouvalis to help run his 2018 re-election campaign. Bad enough Canada’s biggest city is heading towards a chaotic municipal election after Ontario Premier Doug Ford pulled a “tinpot dictator” move, vowing to remove half the seats from City Hall and redraw the city’s boundaries with no consultation only a few months before Toronto casts its votes.